Please fill out the Captcha. You didn't fill out the Captcha! So far, we've rewarded people just like you with more than $1,579,592 in PayPal cash and Amazon Gift Certificates! What are you waiting for? Get your slice of the pie now! By signing up for SurveyU, you’ll get to share your thoughts on issues, companies, brands, and more that matter to you. Your opinions will then influence companies and brands, and help shape their future decisions. We value your thoughts so we’ll give you points for participating in our surveys. 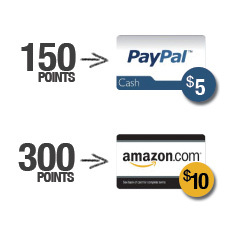 You can choose to convert these points into gift certificates or cash, and once you reach 150 points, you can redeem them. Besides being a major influence and helping make brands, companies, and products better for YOU, you can understand what other students think! We’ll share press releases and publicly released results on the site so you can understand your peers’ views too.